I haven’t always been a big fan of Alley Kat brewery. There are definitely some positives. They’re local, and try to source their ingredients locally as much as possible. They make a pretty good effort to keep waste to a minimum. They’re also Edmonton’s longest running Microbrewery, which is a pretty big deal. Another of our author’s here (Blaine, for those paying attention) had a chance to hear Neil Herbst speak at a Beer Geek’s Anonymous event and touched on it in this post. For my money, Alley Kat’s offerings have always tasted a bit too much home brew and not quite enough craft brew. I’m happy to report that my opinion is changing. Alley Kat has started producing their Big Bottle series, which are limited runs released in 650mL bottles. The current offering is Fresh Hop Full Moon pale ale, which isn’t to be confused with their Full Moon pale ale. The fresh hops make all the difference. This ale pours with nice clarity and a good head. The hops are nicely present up front, beginning a bit piney but ending up with a bit of citrus. The flavour leans towards bitter, but not as much as in an IPA. In that sense it might be a nice gateway beer for those interested in exploring the hoppy side of beer. I think the difference in this beer can be tied right back to the title. Freshness. The fresh hops lend flavour and depth, which make for a much more interesting beer. I’ll close this post up by telling you that I love this beer. I will gladly drink it again. In a limited edition sense. To combat that, I already have a few more bottles in the fridge. Let me begin with a general note about beer. I came by this beer under the best circumstances possible. It was gifted me by a good friend who brought it back from lands far south of us. The only proper thing to do at that point is to share it, which I didn’t do then so that I could share this with you now. This is a pretty clean and well balanced IPA. It pours smoothly with very little head, and the colour is an impressive copper. I taste both the malt and the hops here, the former presenting with some caramel and coffee leaning towards a roasted flavor while the later lends some spice and a bit of resin. The are some subtle fruit tones that I really appreciate as well. It finished with slight bitterness that I like in an IPA. Again, I need to mention how well balanced this beer is. I would gladly drink this again, given the opportunity. It’s not often I get my hands on a craft beer from Louisiana up here in Canada. On Tuesday night I had the pleasure of attending the Edmonton Beer Geeks Anonymous night at Wunderbar. If you are not familiar with either the EBGA or Wunderbar you owe it to yourself to check them both out. Don’t let Wunderbar’s sketchy dive bar appearance fool you. It’s a friendly bar with an incredible beer selection that destroys the terrible offerings presented by most bars and pubs in Edmonton. And I’m told they have some pretty great live music as well. This month’s guest was Neil Herbst from Alley Kat brewing here in Edmonton. Neil brought three of his excellent beers with him; Ein Prosit!, Red Dragon Double IPA, and a very special Fresh Hop Full Moon pale ale. Neil gave us a bit of information and background on each beer, spoke about his brewery and passion for beer, and answered questions from the crowd. Did you know that Alley Kat is wildly popular in Seoul, South Korea? Me neither. I had a chance to try the Ein Prosit! and the Fresh Hop Full Moon but by the time I was ready to go up and get a pint of the Red Dragon Double IPA it was sold out. I guess that must mean that the IPA was good, should have bought the IPA first. Oh well. I’ll have to pick up a bottle of the Red Dragon to try later. It’s part of Alley Kat’s new big bottle series. The big bottle beers are limited edition runs of 650ml bottles, I guess I’d better not wait too long or I’ll be out of luck. The Ein Prosit! is an Oktoberfest lager. It’s made with six, yes six different types of malt, four of them being caramel malts so unsurprisingly it was very malty and caramelly. If you are a hop head you probably won’t like this beer as it had only a very light hoppy finish but it is an Oktoberfest lager and apparently they are all about the malt. If you want a hoppy beer look elsewhere, like maybe at the Fresh Hop Full Moon. This was a delicious beer, like a big glass of bread! I would definitely drink this one again. However, this is one of Alley Kat’s seasonal brews and it is only available until the end of fall. If you or I are looking at drinking this again, we’d better hurry. 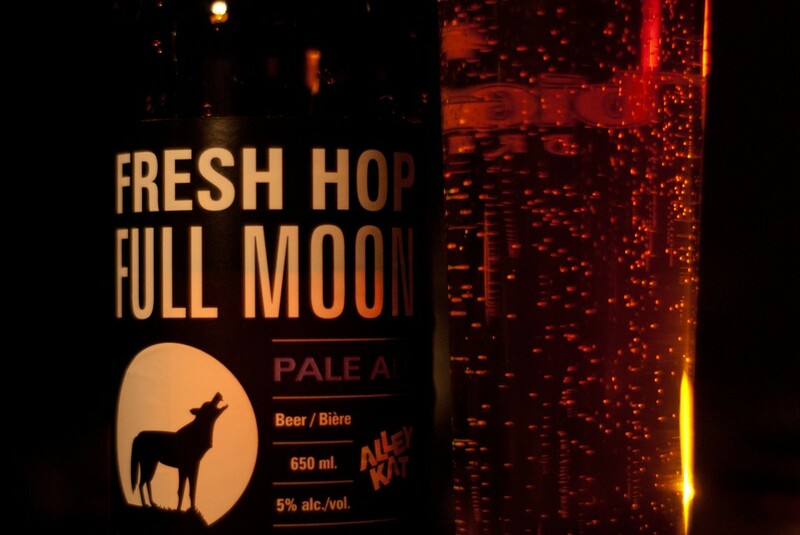 The Fresh Hop Full Moon is a very special pale ale that Alley Kat is brewing in limited supply. Alley Kat has been brewing Full Moon for a long time so in one sense it’s not that special. What makes this one so unique is that Alley Kat used fresh hops. Normally brewers use dried hops but these hops went from the vine to the brew pot within hours (days?). I’ve never tried the regular Full Moon so I can’t say that the fresh hops made any difference. Some people swear that they do, Neil Herbst says he is skeptical. I guess I need to do a comparison of the two. I only had a small sample of the Fresh Hop Full Moon but it was a really nice looking beer, almost red. The sample was too small to talk about the head or any of that. I couldn’t place the smell, very distinct and unique but I don’t know what it was. Kind of a green smell I’d say. The taste was fantastic, very hoppy. I would drink this again in a second but I’ll have to be quick, it’s very limited! 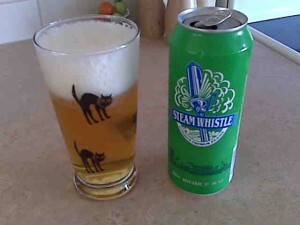 I had seen Steamwhistle Pilsner around for a while but I was hesitant to try it, thinking that it was probably just another macro produced light beer. 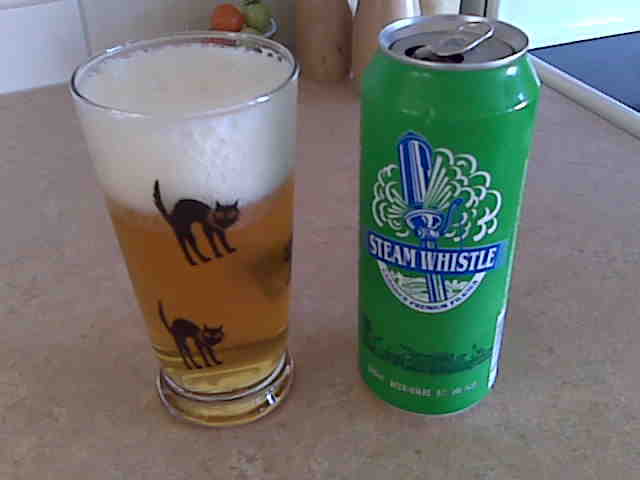 However recently I was in a Liquor Barn or Liquor Mart or Liquor-rama or something like that and saw singles of Steamwhistle Pilsner in a can for $1.99 so I thought, why not.The can sat in my fridge for a week or so but I finally got around to trying it this weekend. It poured a golden yellow with a thick head which dissipated after three or four minutes. Left a thin foam on top with small bubbles rising the entire time I drank it. No surprise there. OK, I know the photo is terrible, I took it on my Blackberry. If someone wants to buy me an iPhone or Android or whatever with a better camera, feel free. Also, the halloween cat glass is the best glassware I have for beer. Once again, if anyone wants to buy me the proper glassware for my beer I will gladly accept! I smelled malt and fruit, apricot maybe. It also had the expected slightly sour hops smell I associate with a pilsner. Surprisingly toasty malt. Pleasantly bitter. From the nose I expected it to be sweeter and fruitier however it was not overly sweet and none of the fruit came through. I found it to have a nice balance of malt and hops. I felt some fizzy carbonation at the back of my mouth but not too much. I drank this while sitting outside in the sun and as it warmed up I enjoyed it more and more, which is a good sign for a beer. If your beer has to be drank ice cold maybe there is something bad hiding in there. It’s possible that due to being in the sun the beer may have been struck by the sun a bit as I picked up a bit of skunkiness in the aroma right at the end. Overall a pleasant beer. I am not too familiar with pilsners but this was good. I wouldn’t go out of my way to get it but I’d have no problem drinking it again, especially if you bought it for me! My niece lives near Toronto and tells me that she prefers Mill Street Organic Lager over Steamwhistle Pilsner, sort of an apples and oranges comparison but I guess I’ll have to give the Mill Street a try! 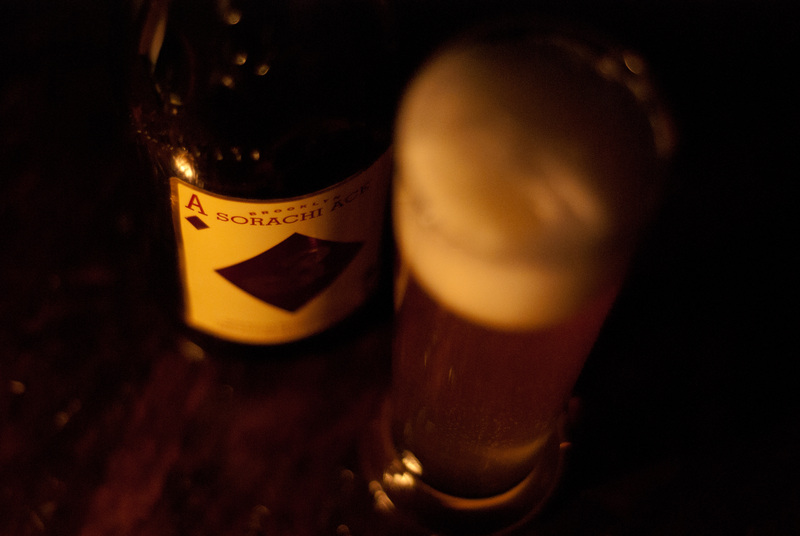 Sorachi Ace is described as a farmhouse ale or saison by its makers, The Brooklyn Brewery. 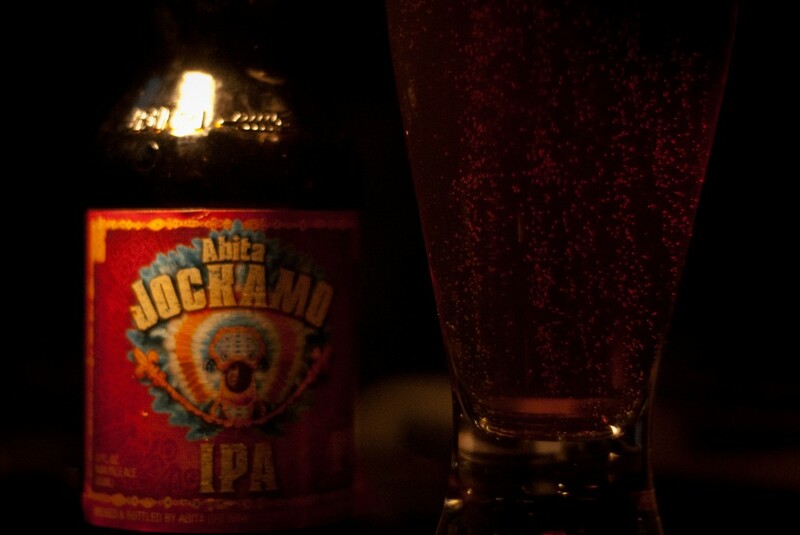 It features and is named for the rare Japanese Sorachi Ace hop. Pour this cloudy gold beer slowly, as it’s rather sudsy. I enjoyed both the hop and the lemon flavor right away. I tasted wheat and a bit of spice through the middle before it finished dry and sweet. Overall a very light, bright beer with a nice range of flavour. Beyond the uniqueness brought by the sorachi ace hop, I enjoyed the little reminders of two of my other favorite types of beer: Czech pilsners and Belgian ales. But would I drink it again? Absolutely. In fact, I already have.